What to do if you miss your local? Recreate it in another city of course. That's the tack that German artist Tobias Rehberger took when he designed the New York Bar Oppenheimer - in exactly the same size and proportions of its namesake in Frankfurt. The NY bar contains all the same furniture and interiors details as the original, from the lighting to the tall radiators. One marked difference is that this edition has every surface is covered in eye-tricking geometric stripes that flick around in every direction, mostly using a monochrome palette with flashes of red and orange. 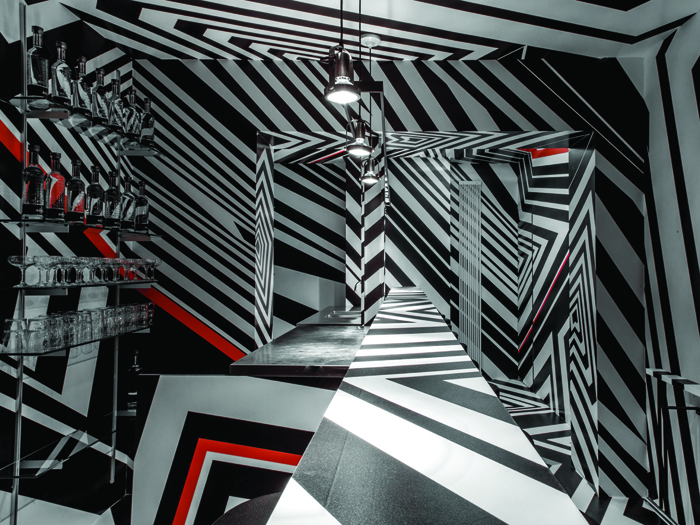 The patterns are based on the concept of dazzle camouflage - a wartime tactic of using a busy surface design that made it more difficult for the enemy to pinpoint ships during surveillance, and which attracted the interest of artists, among them Picasso. Bar Oppenheimer is a real contrast to the rest of the hotel. Guest rooms have the feel of an urban ryokan (Japanese inn) with wooden beds and natural materials while the permanent Bar Americano is where, one imagines, immaculately dressed guests snip cocktails or shots of Mezcal in the nicely neutral colour scheme, amid softly angled pieces of expensive furniture, rounded edges and mood lighting. 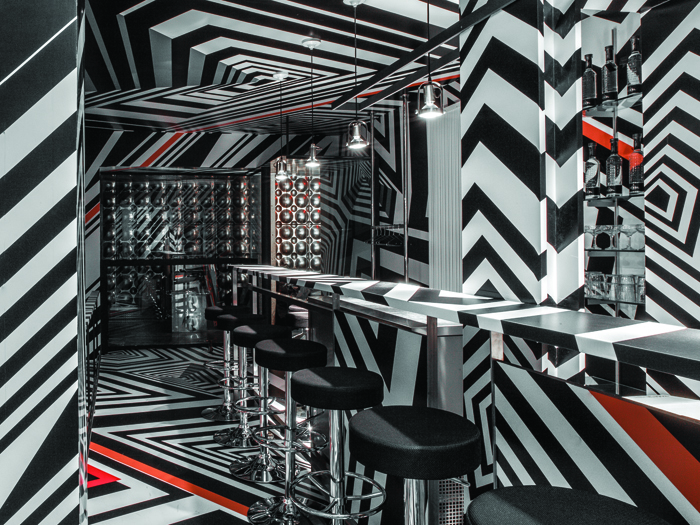 Although Bar Oppenheimer is a work of art , it is a fully functioning bar too, with the essence of the bar captured not just in its look but also in the menu, which includes Vodka Steins, Rehberger's own favourite drink.